Browse this carefully selected list of our best Costa Rica vacations across the country, customized by experts to suit your needs. Beaches, volcanoes, and adventure await! When asked what are the best Costa Rica vacations, experts will tell you it really depends on what you like the most. Beaches, mountains, adventure, jungles, resorts and off-the-grid experiences can all be part of the trip. In addition to that, there’s a warm and welcoming culture with a contagious catch-phrase, Pura Vida. It means take it easy and enjoy the ride, the people, and beauty around you. It can be hard to pinpoint just what to do when you are faced with the number of options a country like Costa Rica can offer. If you are wondering what’s the best of it all, ask no more. At Costa Rica Vacations, we have done the hard work already and compiled a list of the best Costa Rica packages in our belt. Taste a sample of what our clients like best, and keep in mind they are all customizable to suit your needs and wants. This selection of Costa Rica vacation packages represents a fine balance between the most popular packages and travel styles. Couples and families of all sizes find Costa Rica a great destination. There are many activities and sights to please everyone. If your party has more variety, there’s no need to worry. All these packages are completely customizable. Simply pick what gets you excited and give us some details (dates, number of adults/kids). An expert travel consultant gets back in no time with an exact quote for the whole vacation package. These packages can be adjusted again and again until they’re just right. Personalized service and attention to detail is the key for the vacation of a lifetime, so we make sure you’re in good hands at all times. Costa Rica’s astonishing biodiversity and lively vegetation are the perfect backdrop for a vacation abroad. And if you have a particular reason to travel, that’s even better. Whether it’s a family adventure, a relaxation trip, an adventurous honeymoon or Christmas in the tropics, there’s somewhere to go and something to do. Most packages feature a mix of jungle explorations and beach relaxation to ensure you get the best Costa Rica vacations. Any nature enthusiasts, bird watchers, yoga aficionados, or experienced anglers are also more than welcome. There’s plenty for you to see, hear, and enjoy. Travel consultants are eager to share their extensive Costa Rica expertise about any of these topics. The advantage of choosing with us is that there are extra perks included with every travel itinerary. Experience a private Meet & Greet service at the airport and top-notch transportation when going from one location to another. In addition, there’s an included in-country concierge service. There’s someone available to you at every point of the vacation! The top Costa Rica vacation packages out there feature the “big ticket” names such as Manuel Antonio, Arenal Volcano, and Papagayo Peninsula. These areas are famous for their world-class resorts, boutique hotels, adventure, and nature. With their postcard panoramas, year-round great climate and a plethora of activities, these locations not only amaze new visitors but keep seasoned travelers coming back for more. Each area offers something unique. Combining two destinations a great way of satisfying everyone’s cravings and getting the best of Costa Rica. With a travel consultant that knows the country personally, it’s easy to find a combo that works and brings out the best in the country. Decide what is what you really want to do in Costa Rica, and from there everything else is arranged! Adventurers definitely want to visit the Arenal Volcano area, the capital of heart-racing experiences in Costa Rica. Discover all kinds of thrills by zip lining across the forest canopy, face river rapids, go horseback riding across the hills, or ATVing in the mud. And there’s even more! Simply tell your travel consultant what you want and get your fix of adrenaline! Nature lovers are in for a treat! Basically, any destination showcases a great array of wildlife and vegetation. Birdwatchers’ hot spots are Monteverde, Osa Peninsula, and Tortuguero National Park, while hikers can head to Arenal as well. Watch out for all kinds of monkeys, butterflies, lizards, and insects that abound in these areas.If you want to see some wildlife and stay near the beach, choose the Manuel Antonio area, set on the Central Pacific coast of Costa Rica. Sloths, scarlet macaws, toucans, colorful frogs, turtles, and many other animals abound in some of these areas, ready for a camera shot! Costa Rica translates literally to “Rich Coast,” and it’s named like that for a reason. The white-sand beaches are a mixture of ocean waves and forest growth. This beauty is what makes them the most popular destinations in Costa Rica. All-inclusive and luxury resorts are particularly famous on the North Pacific, and they’re set right on the beach. These are perfect for a week-long relaxing vacation and indulgence in extravagance. Surfers and yoga practitioners have their haven in the secluded beaches of Nicoya Peninsula. Here boutique hotels have a laid-back atmosphere focused on wellness and connection with nature outside. And if you like fishing, anglers have where to dock as well. 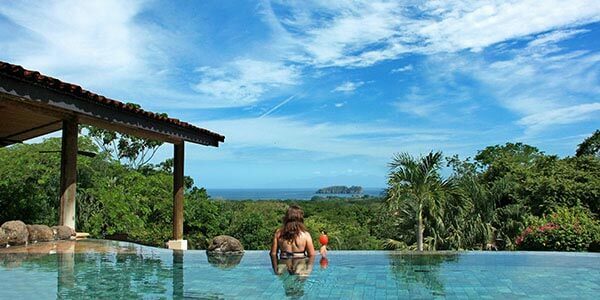 Jaco’s famous Los Suenos Resort and the Manuel Antonio area are great points of departure for a journey into Costa Rica’s oceans. Choosing the best travel packages to Costa Rica doesn’t have to be difficult. The best package is the one that has what you want to do in it. Visit iconic locations, take part in great excursions, and experience Costa Rica’s hospitality and natural beauty. Unwind, explore, and enjoy the best of Costa Rica in your own style! Simply contact us, and we’ll gladly help answer any questions and put together a personalized package just for you.